iRealHousewives | The 411 On American + International Real Housewives: Kandi Burruss Opens Up About Co-Parenting With Ex Russell “Block” Spencer! Kandi Burruss is taking to her Bravo Blog to dish on this week's episode of The Real Housewives of Atlanta. Kandi Burruss provides some insight into her daughter's emotional reaction to a phone call from her dad. BravoTV.com: What does Riley want to do once she graduates high school? 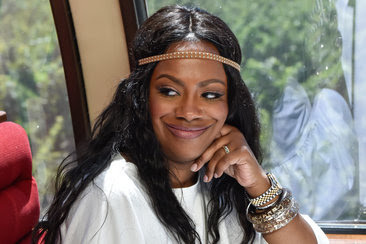 Kandi Burruss: Riley wants to go to college. She hasn’t decided what field she wants to be in yet, but we’ve talked about her possibly being a lawyer one day. BravoTV.com: Why did Riley get so upset after talking to her dad? KB: She’s sensitive when it comes to the situation with her dad. She tried to put up a strong front when the cameras are around, but as soon as she got out of their view, the tears began to fall. BravoTV.com: Has it been difficult co-parenting with Block? KB: We haven’t really co-parented because he’s never been involved. I stopped expecting anything from him a long time ago. It’s not difficult when you get to make all the decisions because the other parent doesn’t participate.